Series 477 Handheld Digital Manometers are packed with features you need to make low pressure measurement and recording faster, easier and more accurate than ever. First, you can instantly select from up to nine of the most widely used pressure units without having to waste time and risk mistakes with tedious conversions. Next, a non-volatile memory function enables storage of up to 40 readings - perfect for HVAC technicians making Pitot tube traverses of airflow readings across a duct. The Series 477 is FM approved intrinsically safe for hazardous locations, Class 1, Div. 1, Group A, B, C, D, T4. When working in poorly lighted areas, just switch on the handy backlight feature. It automatically shuts itself off after 20 minutes to minimize battery drain. Electronic zeroing means you simply touch a single key to perfectly null out any minor pressure differences. A display HOLD key freezes the current pressure for those all-too-common situations where readings fluctuate. We even included an audible alarm to warn you of overpressure plus a visual alarm also confirms a value has been stored, eliminating the need to observe display during a duct traverse. 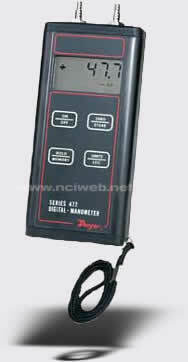 A new option for the Series 477 is a USB interface. Combined with the 477's datalogging capability, a user can now quickly and conveniently download the stored readings to any USB campatible device. Data manipulation can be easily accomplished in a multitude of word processing or spreadsheet programs. USB models come with a USB cable and a software CD. New USB Option Comes with Cable and Software for Easy Data Downloading. Instant Selection from up to Nine English/Metric Units. Stores 40 Readings in Memory for Later Reference. Measures Positive, Negative or Differential Pressures. Large Easy-to-Read 0.4" LCD Display Includes Switchable Backlight for Great Visibility - Anywhere! Both Audible and Visual Overpressure Alarms. Includes + and - Indicators plus Low Battery Warning. Operates up to 100 Hours on a Single 9 Volt Battery. Service: Air and compatible gases. FM models: air and compatible combustible gases. Accuracy: ±0.5% F.S., 60 to 78°F (15.6 to 25.6°C); ±1.5% F.S. from 32 to 60°F and 78 to 104°F (0 to 15.6°C and 25.6 to 40°C). Pressure Hysteresis: ±0.1% of full scale. Pressure Limits: See chart on "Ordering" page. Temperature Limits: 0 to 140°F (-17.8 to 60°C). Compensated Temperature Limits: 32 to 104°F (-0 to 40°C). Storage Temperature Limits: -4 to 176°F (-20 to 80°C). Display: 0.42" (10.6 mm) 4-digit LCD. Resolution: See chart on "Ordering" page. Power Requirements: 9 volt alkaline battery. Battery included but not connected. Weight: 10.2 oz (289 g). Connections: Two barbed connections for use with 1/8" (3.18 mm) or 3/16" (4.76 mm) I.D. tubing. Two compression fittings for use with 1/8" (3.18 mm) I.D. x 1/4" (6.35 mm) O.D. tubing for 477-7-FM & 477-8-FM only. Agency Approvals: CE and FM, USB models are not FM approved intrinsically safe.